Your pet hamster will be healthiest when he is eating a balanced diet that contains plenty of grains and seeds, as well as fresh fruit and vegetables. While it is a good idea to provide your hamster with a variety of fresh foods, you should use some caution when providing him with different fruits and vegetables because some foods have the potential to make him very sick. Whether your particular pet hamster likes the taste of tomatoes will depend on your pet's individual preferences. Feeding a good balance of fruits and vegetables helps you figure out what foods your hamster prefers as well as helps maintain a balanced diet. Over time, you may come to realize your hamster devours lettuce and only nibbles occasionally on celery, or that he loves carrots but snubs sprouts. Regardless of how much your hamster seems to like tomatoes, you will need to use caution when feeding them to him. Tomatoes generally are not considered to be poisonous and your pet hamster is unlikely to experience any negative side effects from occasionally being fed a very small amount of ripe, red tomato. Feeding green tomatoes or the leaves off of a tomato plant is not safe, and should not be done because it will make your hamster sick. 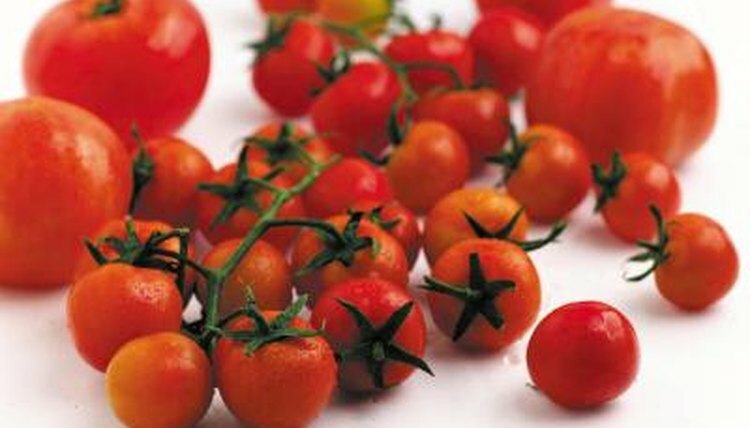 Feeding large amounts of tomato also is not considered safe and should not be done because of the amount of acid that is contained in tomatoes. The acid in tomatoes can upset your hamster's stomach and cause him to suffer from diarrhea, which easily can lead to dangerous dehydration. Dehydration is one of the most common problems pet hamsters face and can be fatal if your hamster is unable to rehydrate adequately. A dehydrated hamster may be unwilling to eat, lethargic or weak, or appear to have sunken eyes. If your hamster is dehydrated, his skin will tent when pinched instead of retracting back to its original position the way it is supposed to. Your hamster only needs a teaspoon full of fresh fruits and vegetables every day. A safe amount of tomato for your hamster should be no more than half a teaspoon's worth, and tomato should be a rare treat rather than a staple food in your hamster's regular diet. If your hamster does not like tomatoes or seems reluctant to eat them, you might as well leave these fruits out of his diet altogether. Tomatoes do not offer any significant unique health benefits to your hamster.